Home > Planning & Design > When Should You Send Wedding Gifts? When Should You Send Wedding Gifts? It should be convenient for you and the couple getting married! Wedding gifts can be a touchy subject to talk about. Etiquette says that a couple getting married shouldn’t expect them, but also advises guests to give one. The realistic approach is probably that if you are attending a wedding, give a gift that you can afford, and if you are getting married, never blatantly ask for presents. However, there are plenty of other guidelines for guests to worry about. Choosing something from the registry or sending cash is the safest bet in terms of what to give, but what about the question of when? Most etiquette experts agree that wedding invitees have a year following the big day to bestow a present upon the happy couple. That said, if you do wait until after the I dos, you’re probably safer sending something within a month or two. Otherwise, you may risk the newlyweds assuming you forgot or chose not to give them a gift. Obviously, they’ll eventually be corrected of this assumption when the present arrives, but it’s always best to avoid a miscommunication when possible. Plus, there is always the chance that after too long you really will forget. So, there is a “too late” when it comes to buying a wedding gift, but can one be purchased and delivered too early? Well, sending it before an invitation arrives may feel like you’re assuming you’re a part of the big day, but once you’ve received a save the date or invite, you are good to go! It’s actually often easier for the couple because the thank-you note writing process can be more spread out. However, if the lovebirds are moving to a new city after the wedding, it may be more inconvenient to have to store gifts in the meantime and then transport them. It’s always important to look at the specific situation before deciding. Though it may be unexpected, it’s actually possible to be too “on-time” with a present as well. 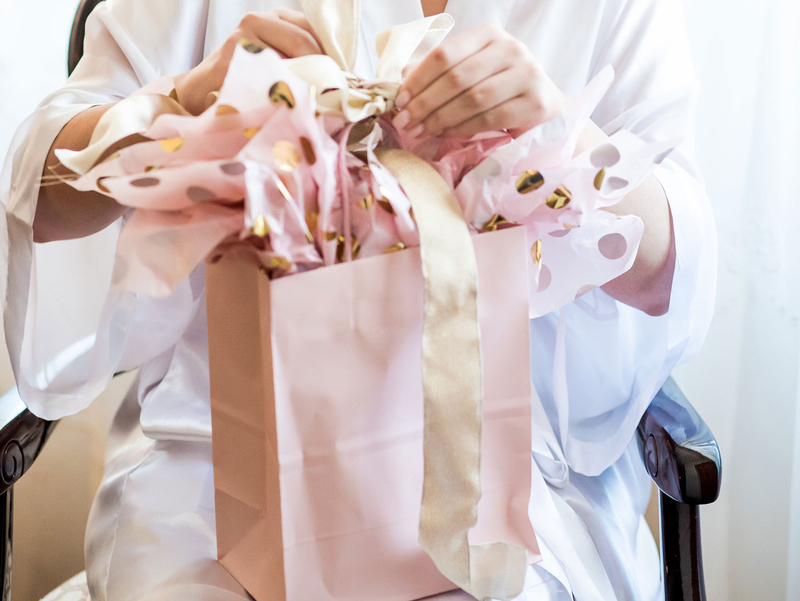 It’s certainly permissible to bring a gift to the wedding, but more often than not, it is easier for the couple if it is sent to their home – especially if they are getting married out of town. While it’s not against etiquette, it can be a hassle if the newlyweds receive packages the week of – and immediately after – the big day. If the sweethearts tie the knot away from home and then go on a honeymoon, they may be gone for several weeks. In that time, packages can pile up and not be secure. Sending a card with a check should be fine, as the postal service allows for long-term vacation holds. However, FedEx has a 14-day limit, while UPS only allows a seven-day hold. Depending on which service the retailer uses, your gift could be at risk. If you did wait until the last minute to order, it’s likely better to wait just a little longer and make sure the present arrives after the newlyweds return home. For more, discover ideas for engagement gifts for friends and family and find out what should go in wedding welcome bags.